So much has happened in such a short time. This just goes to show that when we use our people power we actually shift our political conditions and realities. On Wednesday, December 2nd the No New SF Jail Coalition mobilized close to a hundred people to San Francisco City Hall where the Budget and Finance Committee of the Board of Supervisors were attempting to approve the funding for the proposed new jail. The Board of Supervisors knew we were coming and pushed back the jail-related items to the end of the meeting. After sitting through over an hour of budget and finance they finally read out the agenda items related to the jail. As soon as they finished reading the agenda, organizers in the back of the hearing began chanting and unveiled a banner that read “NO SF JAIL” as 5 organizers in the front of the hearing deployed a lock down. 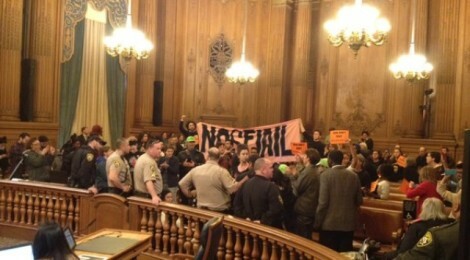 The room erupted with chanting and shouting declaring “No new SF jail” and that we were shutting the hearing down. Organizers shut down the hearing for over two hours, turning City Hall over to the power of the people. Our demand was simple: this hearing cannot continue; you must stop this jail project now. While our supporters on the Board of Supervisors stood with us and our demands, Conservative Supervisor Mark Farrell insisted that the hearing would not be cancelled. After 2 hours of shutting it down declaring “House keys not handcuffs,” “Lift us up, don’t lock us up” and urging “Supervisor Tang, do the right thang,” the police issued a dispersal order. All community members left the hearing without arrest except for the 5 freedom fighters locked down in the front of the room. The No New SF Jail 5 held their ground until they were physically cut out of their lock-down with power saws and bolt cutters, forcibly removed and arrested due to the hearing recess and dispersal order requested by Supervisor Mark Farrell. The hearing continued after the No New SF Jail 5 were arrested. With a stacked public comment and a strong opposition, the hearing clearly showed that a new SF jail would be wasteful, unnecessary and violent at a time when we could invest in viable community alternatives. The hearing ended with a decision to move the issue forward without positive recommendation and delay a vote on the jail funding until December 15 when the full board can hear the options, including newly elected Board of Supervisor Aaron Peskin. This victory is due to the No New SF Jail Coalition’s and all of our partners powerful organizing and legislative advocacy. With this win we are in an even stronger position to fight the proposed jail! The No New SF Jail 5 have been released from jail and now know personally that the Hall of (in)Justice at 850 Bryant is indeed decrepit and unsafe. This is why we demand that the 850 Bryant be closed immediately, not rebuilt and that all people currently locked in cages inside be released into their communities. We are continuing to build power, organize our loved ones, and raise hell until there is No New SF Jail. Now the Board of Supervisors knows that if they continue to ignore our demands that we will make sure that we are heard. If you have been waiting for a time to get involved in this jail fight – the time has come. Stay tuned for updates, tell your friends and come out strong with us in the next two weeks against the proposed new SF jail. Make calls today. Mark your calendars to turn out on December 15th at 2pm at the SF Board of Supervisors. Another San Francisco is possible!